The HORTILED Inter has been specially designed for high wire cultivation of greenhouse vegetables. The HORTILED Inter is placed within the crop to supplement your top lighting. Suitable for 230 Volt. Other voltages possible. Always the optimum beam angle for your crop. Based on years of experience. 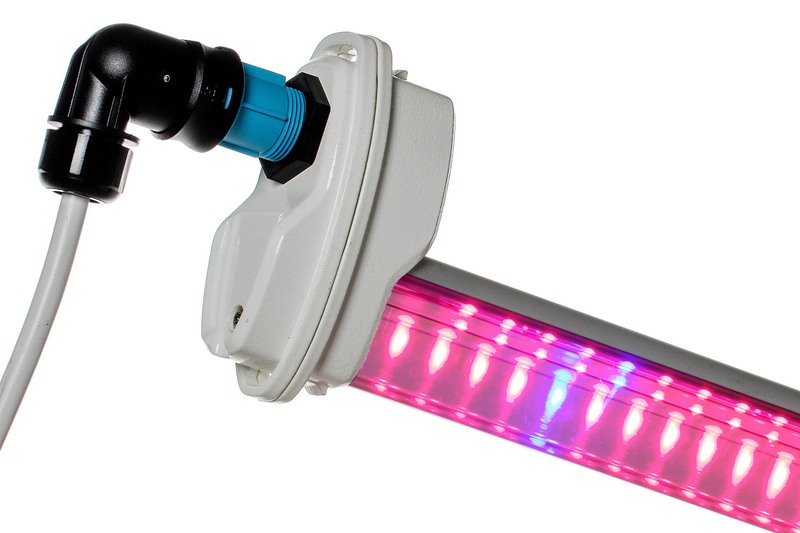 With 3.00 µmol/J, the HORTILED Inter is the most efficient fixture when compared with similar products on the market. The HORTILED Inter provides 10% more light per m2 than other LED products. The Hortiled Inter has been specially designed with integrated optics for an optimum light distribution. The leaves are lit from above, even between the plants. Independent research has shown that the top of the leaf in green plants uses light up to 20% more efficiently than the underside of the leaf. Lighting from above therefore increases light utilisation and minimises light loss. An asymmetric version of the fixture which emits light to one side is available for installation along the gable. The special diffuse LED optic in the HORTILED Inter prevents direct contact between the leaf and the LEDs. This minimises the risk of leaf burn.. The HORTILED Inter is highly suitable for use in hybrid systems with HPS and LEDs. The fixture can easily be combined with traditional systems such as NXT2 1000@ and NXT2 600W or with the HORTILED Top from our LED product line. The HORTILED Inter has a plug-and-play connector system. A pluggable set of 6 fixtures is supplied from a single external driver. This driver is installed underneath the gutter where it is easily accessible for maintenance. The connectivity, light weight and compact design of the fixtures make them very straightforward to install and easy to replace if a module develops a fault. Finally, the HORTILED Inter is available for different supply voltages (100 – 240V), which means minimum conversion of existing systems. The colour spectrum of the HORTILED Inter (95% red / 5% blue) has been specially developed for the specific application intended for this product. Naturally, it is also possible to develop a customised light spectrum at project level.